The previous example of a shift in a communication was taken from light-years away. However, it is not necessary to travel such a long distance to come across circular movements and their interpretation in terms of a displacement. 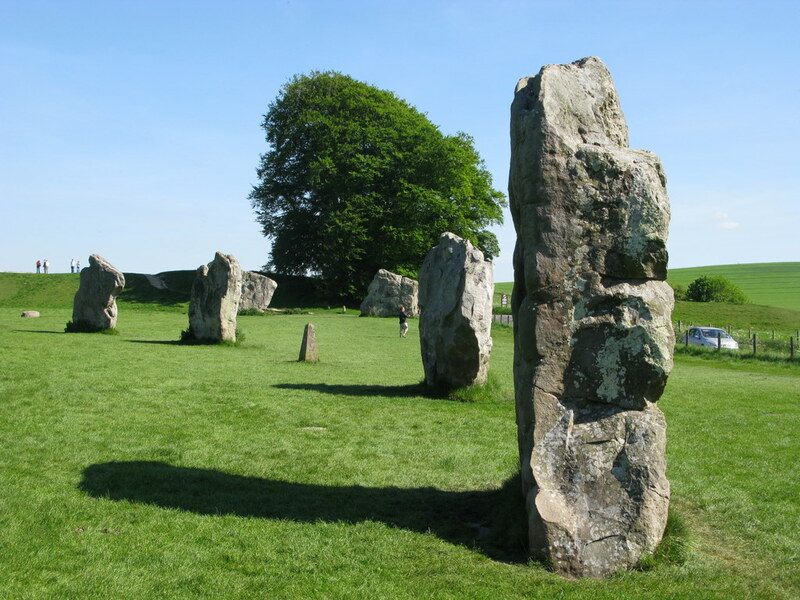 We only have to think of the archaeological stone circles to see the dynamic possibilities of change at work. 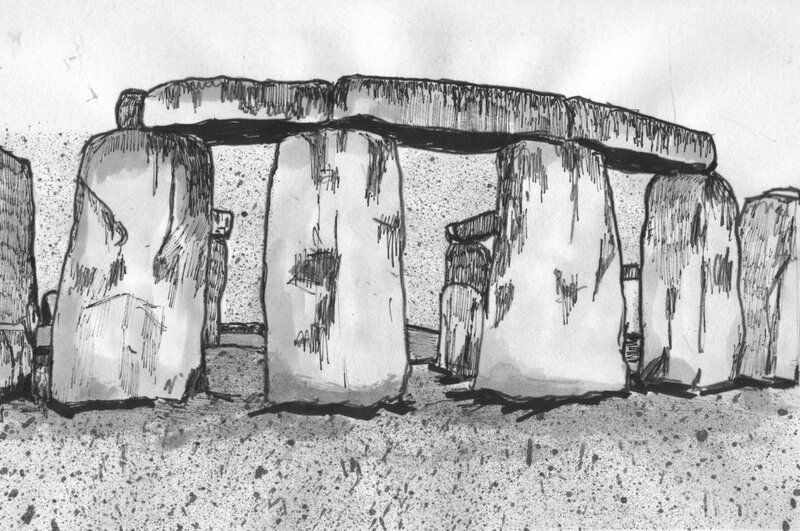 The best-known example is, of course, the site of Stonehenge near Salisbury in Southern England, build from around 2000 BC in different phases (fig. 61). Many more stone features are known from Great Britain, Ireland and the Continent. Fig. 61 – Part of the large stone circle of Stonehenge on the Salisbury Plain in England. The stone circle was already mentioned by Diodorus Siculus in his ‘Bibliotheca Historica (II, Ch. 47-48) as ‘a notable temple which is adorned with many votive offerings and is spherical in shape’ devoted to the god Apollo. Many theories of their origin have been posed over the years. Sometimes they are perceived as indicators to cosmic directions and regarded as time indicators. Their function as ritual center is stressed in the present approach. The traditional explanation of the position of the stones pointed to a relation with cosmic directions. Astronomical alignments were drawn, using the position of the sun and the moon on certain days of the year as time markers. The emphasis is on the position of the stones as ‘calendar stone’, or cosmic clocks, which provided a time for recurrent religious and agrarian activities. Furthermore, their role to predict the seasonal eclipses of the sun and the moon was indicated (HAWKINS, 1973). The engineer Alexander Thom (1894 – 1985) was a determined and lifelong investigator of stone circles. He believed that the siting of the stones (in Cumbria) was ‘controlled by the desire to indicate the rising or setting positions of the sun at important times’ (THOM & THOM, 1978). The cardinal points were another point of observation, besides the correlation with calendrical delineation. It was noticed (at the Long Meg stone circle), some two hundred and fifty years ago, that ‘the four stones facing the cardinal points are by far the largest and most bulky of the whole ring.’ Fred R. Coles surveyed between 1895 and 1911 more than thirty Scottish Four-Posters and was the first to realize that these previously unrecognized rectangular megalithic settings were a special form of stone circle (fig. 62). Fig. 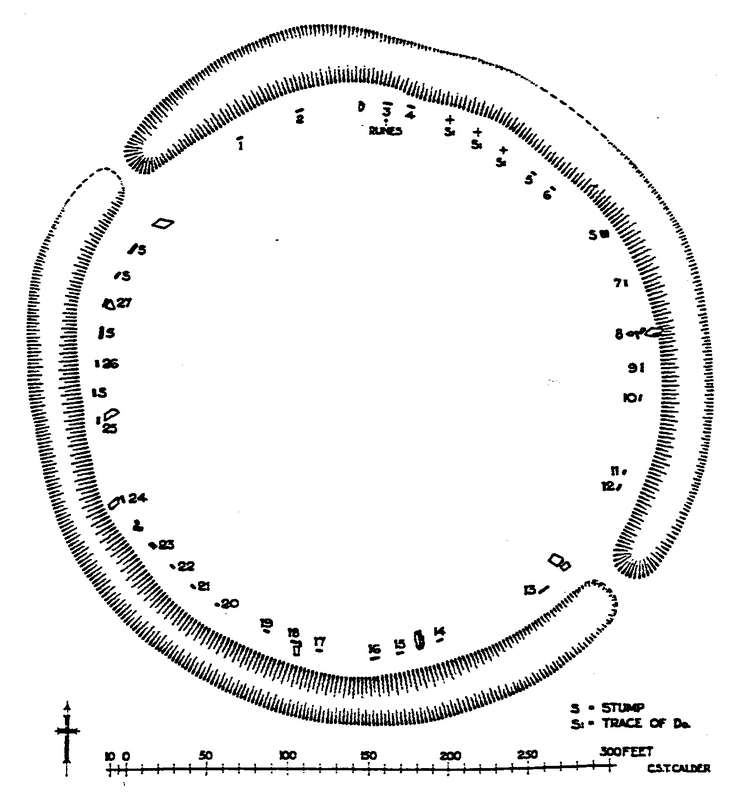 62 – The stone ring of Brodgar (Orkney Islands) is given here on a map by Charles Calder (1929). The feature is one of the many stone circles discovered in Great Britain and Ireland. Stone circle of Avebury (England) (Photo: Marten Kuilman, May 2010). My opinion is that more attention should be given to the aspect of place rather than of time. That is to say: direction, which was used not (only) to measure time, but had its own importance as the indicator of a position in a general (personal) communication. The stone circle can be seen as a ‘communication-model’, in the widest sense. The geometrical setting was used to solve critical questions, which arise in any communication. The stone circle gives not only an insight in the relation between cosmos and man, but also between man and his environment, his interaction with other human beings and finally provides the knowledge of the division as an objectification of man himself. The circles – and maybe the long rows of stones like those at Carnac in Brittany as well – might have had the same function as the CF-graph in the quadralectic environment, i.e. a universal slide-ruler for every imaginable and unimaginable situation within a communication to determine a position. The importance of Time and the whole idea of a ‘calendar’ should, in my opinion, not be over-emphasized. The persistence to draw this aspect in front of our attention tells us more about the priority of the Western scientific researchers in their quest to solve the meaning of the Stone Age buildings and their obsession with time in general. It is questionable if the actual state of mind of the megalithic people, living some four millennia before us – having no other time-conscious than that of the diurnal rhythm and the seasons – was really geared towards the passing of time. It seems more likely, that their main concern in life was focused on their position on this world and universe. Where do I stand? What do I see? Why am I here? That sort of questions must have been inexplicably more important for them (and for us) than the date of the next sun- or moon eclipse. It is imaginable that the stone circles were used in the same way as churches have been over the ages: as places of (personal) worship and orientation. BURL (1988, p. 2) put it as follows: ‘Each community built its own ring, sometimes with the assistance of neighbours. It was accepted that four stones were needed, but, after that, not only did each region differ in its architectural foibles but each group within the region also differed in the features it chose to incorporate or to exclude in its own monument’. The physical position (in the field), in combination with the conscious experience of a cyclic motion (walking around the stones) might have given some spiritual and/or ritual experience. If the stones were valued, in one way or another (in reference to their shape), it is imaginable that a calculation could be made in relation to one’s position inside or outside the circle (or row) (fig. 63). Fig. 63 – A hypothetical stone circle and its function as a place of terrestrial worship. The positions outside the circle (P1 and P2) can be valued (encircled) according to a line of sight. It is obvious that the positions, and the ‘valuation’ can vary endlessly. The stone circles as a universal means of worship and orientation in the widest sense, should be further investigated. The stone circle (and possibly also the enigmatic elongated rows of stones in Brittany) could be an ancient measure of communication. Not an astronomical clock (highlighting some cosmic event), not a compass (to give a linear direction in space), but a real item for measuring the human mind in its interaction with the surrounding earth. The stone circle might have been a genuine ‘communication machine’ at the center of an ancient worship. 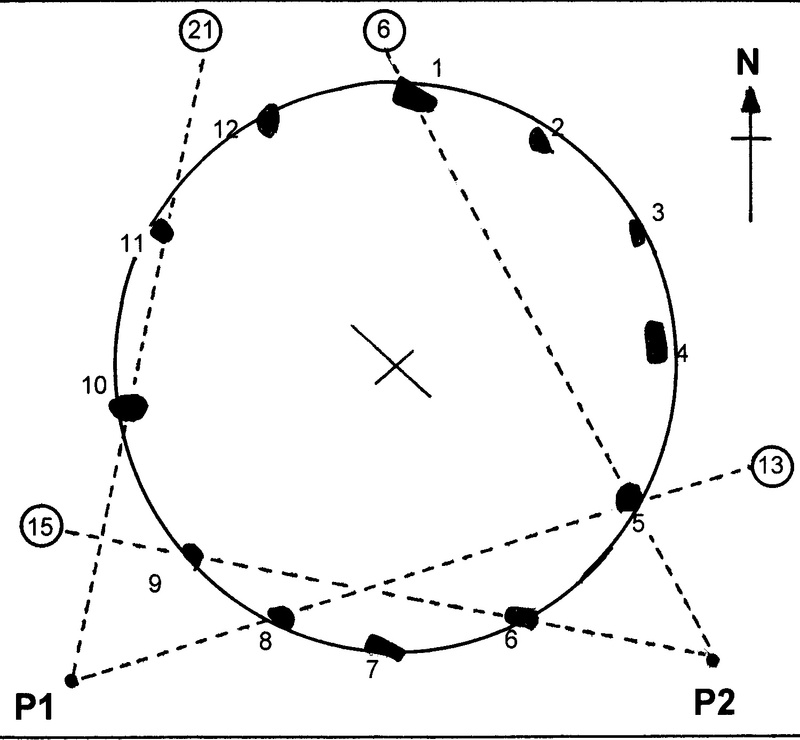 A particular physical position (or viewpoint) outside the circle would result in a specific lining-up of rocks. This line can produce a ‘value’, and gives a clue for that position. With some imagination even a variation of the children’s game of Blind Mans Bluff can be proposed. The generation of a ‘shift-figure’, very much like the CF-values in the quadralectic approach, might be a convenient explanation for the occurrence of so many megalithic stone circles. This rather down-to-earth solution of the archaeological puzzle is probably just as plausible as the, often wildly speculative, cosmic explanations for the many outstanding relics of early communication.